Arizona Supreme Court Denies DACA Students In-State Tuition : The Two-Way The ruling means immigrants protected under the Deferred Action for Childhood Arrivals program will have to pay up to three times what they've been paying to enroll in classes starting in summer. Supporters of Deferred Action for Childhood Arrivals protest in Arizona shortly after Attorney General Jeff Sessions announced that the program would be suspended. The fee changes will take effect immediately and in some cases more than triple the annual cost of attendance. The Associated Press estimated community college students who currently pay $2,580 a year will now pay $8,900. Four-year universities will charge DACA students who graduated from a state high school 150 percent of in-state tuition. That will increase annual costs from about $10,000 to $15,000. Those who do not meet the requirement could pay up to $27,618, according to AZ Central. Arizona DACA students are also ineligible for federal or state financial aid. 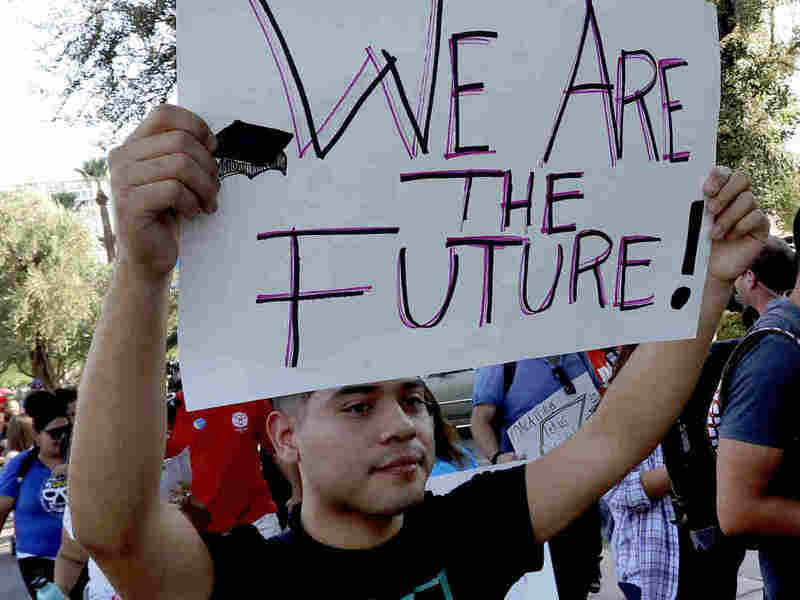 "This is exactly why we need a permanent solution," Karina Ruiz, president of the Arizona Dream Act Coalition, told NPR. Trump's Been Tweeting About DACA. What's That Mean For People In Limbo? "Congress needs to pass the Dream Act and give us a permanent pathway to citizenship, otherwise DACA recipients will continue to be under attack," she said. The Dream Act is a bipartisan bill first introduced in 2001 (and known then as DREAM) that would create a path to citizenship for some undocumented immigrants who were brought to the country as children. Despite strong public support, it has stalled in Congress for nearly two decades. As a result, President Barack Obama enacted the DACA program as an interim measure to give the same group of young people legal protection from deportation and an opportunity to work and study in the U.S.
"With these price increases it makes higher education completely unaffordable for young immigrants who want to go to school. For people who want to contribute to society," said Ruiz, who is covered by DACA today but was not when she attended college. She says she paid for classes out of pocket, which meant she could only afford to take one class per semester. It took 12 years for Ruiz to complete her undergraduate degree in biochemistry. Arizona schools and community colleges started offering the cheaper fees in 2015 after a Maricopa County Superior Court determined DACA students had legal immigration status in the country. When that decision was overturned, both two-year and four-year public schools continued to charge qualifying students the in-state rate while the legal challenges played out in the higher court. "Without a doubt, the Arizona Supreme Court's decision today is a setback for DACA students," Arizona Board of Regents Chair Bill Ridenour wrote in a statement. "The board continues to hope that soon, a congressional enactment will establish the lawful status and presence of those who were brought to this country unlawfully as children and have remained here as law-abiding members of our communities," Ridenour said. The Trump administration rescinded DACA in September 2017 and the Department of Homeland Security had planned for a six-month phase-out ending March 5, 2018. But in January a U.S. district judge ordered that DACA recipients be allowed to continue submitting renewal applications pending final decision on the litigation. Homeland Security has since resumed processing renewal applications; however, new DACA applications are not permitted. The decision on Monday comes on the heels of a similar move in Missouri last month to continue a ban on in-state tuition for college DACA students. In a 104-37 vote, the state House upheld a state budget provision requiring students with "unlawful immigration status" to be charged at the same rates as international students, reported the Kansas City Star. It also bars them from receiving state scholarships. Other states prohibiting in-state tuition for DREAMers are Georgia and Indiana, while Alabama and South Carolina have gone a step further by completely banning them from enrolling at any public postsecondary institution, the National Conference of State Legislatures reported. A 2017 analysis by NASPA-Student Affairs Administrators in Higher Education, which also tracks tuition rates for DACA students, concluded 21 states have adopted in-state tuition policies. California, New Mexico, Minnesota, Texas and Washington offer state financial assistance to unauthorized students. Several states, including Utah, allow public universities to use private sources of funding to support financial aid to unauthorized immigrant students. Connecticut currently offers scholarships through the Dream.Us Scholarship program to DACA students from states that ban in-state tuition eligibility.